To keep you fresh on our mission and values, this month we want to take a moment to go over a few key points about Honest-1 that set us apart from the competition. First off, all of our franchise locations are locally owned and operated. The owner is probably one of your neighbors, and is accessible to you at the shop anytime. We are also a full-service operation – we do everything car-related or we can hook you up with excellent local referrals for the few things we don’t do such as windshield repair and body work. We specialize in individually customizing and performing scheduled maintenance that meets your specific needs. We're 100% committed to diagnosing today's complex vehicles with precision accuracy and speedy turnaround times. We consider ourselves your dealership alternative in fact! We took the plunge and purchased the same state-of-the-art equipment used by leading dealership technicians, and we welcome you to compare our prices, customer service, and speed of service to any local outfit. Let us know how we match up! We also recognize that 70% of auto care customers are women these days. Every decision we make from the corporate level down to even what magazines to put in the lobby takes this into consideration. The company has always been eco-friendly as much as possible too. We have a few eco-friendly auto care options for those customers who are sensitive to these issues. If you are interested, just let us know next time you’re in. You will be surprised what you can do in this area; it’s all about the small steps we can all take on a daily basis. I welcome you to read through the official Open Service Commitment below as well (in the bright green section at the bottom of this newsletter). That is the official corporate statement on what Honest-1 stands for, and it is the lifeblood of our company at every location. We hope this synopsis will help you in referring us to your friends and family, and help you make a decision next time you are in need of automotive care. As always let us know if there is anything special we can do for you! Best Theme Parks in the U.S.
Get Your Rollercoaster Thrills This Spring! 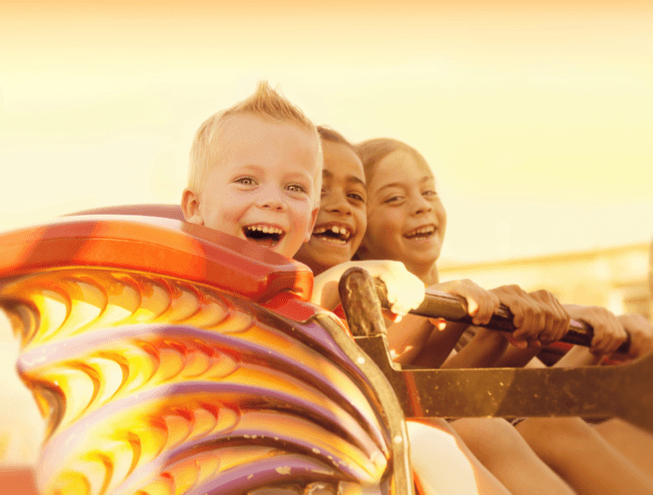 We’ve heard a lot of customers are planning Spring Break trips with the kids to amusement parks so we decided to give you all a run-down on a few of the ones that are unique but fun for kids of all ages (including those in their 30s and 40s). If you have ever been to one of these parks, let us know what you thought! Is It Time for an Alignment Check? Seeing your dog driving down the street would be surprising to say the least! 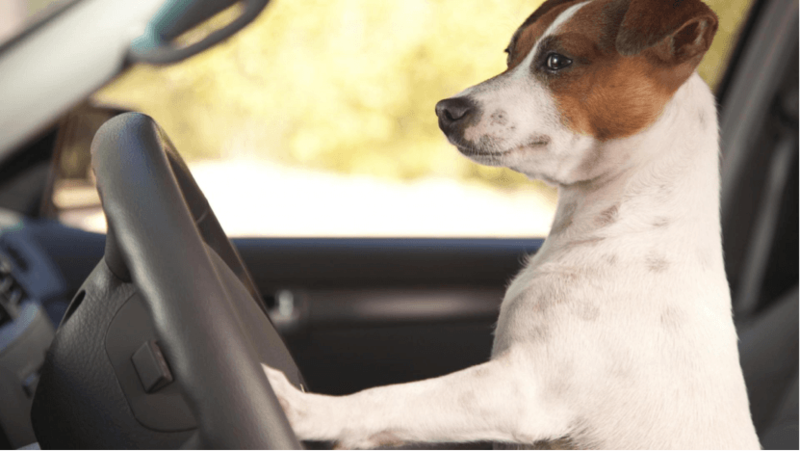 All cuteness aside, it's no surprise that your vehicle will drive better if all the wheels are pointed in the same direction! That's called wheel alignment. If your wheels are out of alignment you may notice that your vehicle pulls to one side or the other. This is a very important issue to keep in check. Something that you won't notice right away, but you will if you keep driving when you're out of alignment, is that your tires are wearing unevenly and fairly quickly. That's because when the vehicle is pulling to one side, you have to steer it back straight. The outside of the tire just wears out fast because you're constantly turning, which can be very exhausting on a long road trip – fighting to keep the vehicle going straight down the road. It may also be an almost unnoticeable subtle reaction. In either case, it is best to know that the vehicle alignment is set properly to ensure you don't have a costly bill down the road on tires and/or other issues that may arise. Some of the things that commonly throw a wheel out of alignment are slamming into a pothole, smacking a curb or something like a rock (it doesn't have to be a big shock, it can just be the regular bumps and bangs of daily driving that add up and eventually take your vehicle out of alignment). Your owner's manual may suggest having your alignment checked periodically; we definitely recommend having it checked if you have any doubts whatsoever, just to be safe. Cost varies by whether or not it's two or four-wheel adjustable. Four-wheel drive vehicles may have an additional charge because they're more difficult to align. If it's been a while since you've had your wheels aligned, bring your vehicle for an alignment check today or call for an appointment. As always, we are happy to give you an in-person estimate before any work is completed.